I very rarely review books here before I’ve finished them. A couple of years ago, I read a few novels and posted multi-day reviews of them, but in general, I make it a practice to read first, review later. This isn’t particularly difficult to accomplish because I derive an almost obscene pleasure out of completing tasks before the deadline. It satisfies a part of me that is just on the edge of obsessive compulsive to do so, and writing about Desert Solitaire before I’ve finished it has the opposite effect. I’m antsy, frustrated, distracted by the fact that I don’t have time to finish one item on my agenda before moving on to the next. Occasionally when this happens, I choose to post about a poem. However, given that I’m neck deep in edits for my own novel, as well as editing a resource book for Pilgrim Press that has seventy contributors, I foresee a few poem Thursdays on the horizon strictly by necessity, and I don’t want to pass up an opportunity to talk about this glorious book. Written in the sixties, Abbey spent a year as a park ranger in Arches National Park in Utah, and this is his luxurious memoir about those months. I visited Arches with my husband a year and a half ago, and when I heard about this book over Christmas break, I asked for a copy from my father-in-law (my Southwest wilderness expert). He obliged, and then life got busy, and I forgot all about it until I was back east in March and saw that my brother also owned the book. I borrowed his, brought it all the way home, and then remembered I had the book on my kindle, which is where I’ve been reading it every night as I wait for my son to fall asleep. Once inside the trailer my senses adjust to the new situation and soon enough, writing the letter, I lose awareness of the lights and the whine of the motor. But I have cut myself off completely from the greater world which surrounds the man-made shell. The desert and the night are pushed back—I can no longer participate in them or observe; I have exchanged a great and unbounded world for a small, comparatively meager one. By choice, certainly; the exchange is temporarily convenient and can be reversed whenever I wish. Finishing the letter I go outside and close the switch on the generator. The light bulbs dim and disappear, the furious gnashing of pistons whimpers to a halt. Standing by the inert and helpless engine, I hear its last vibrations die like ripples on a pool somewhere far out on the tranquil sea of desert, somewhere beyond Delicate Arch, beyond the Yellow Cat badlands, beyond the shadow line. Having grown up in the northeast, I was completely unprepared for how much I would love the west, the southwest, the northeast. Friends are always asking when I’ll move “home” to the quaint steepled towns of New England, and although a part of me will always treasure the years I spent exploring streams that flowed beneath covered bridges and forests broken up by old stone walls, my heart found its home under the huge wild skies of California and Colorado and Oregon. The canyon lands of Utah, the sacred responsibility that comes of making camp deep in the Grand Canyon, the rivers and rapids and stone of our country’s backyard – those are the haunts that beckon to me now. Reading Abbey’s book – its blend of journal and myth – reminds me of how alive I feel just knowing that a place like Arches exists. His opinions and mine don’t always overlap, but it is a privilege to see the land through his eyes. I cannot rush through his journey any more than he could slow or speed up time that year, and I wouldn’t want to. Half a chapter at a time is as sweet to savor as water in his desert. I only hope I can make it last until my own thirst for the out of doors can be quenched with a beautiful adventure. 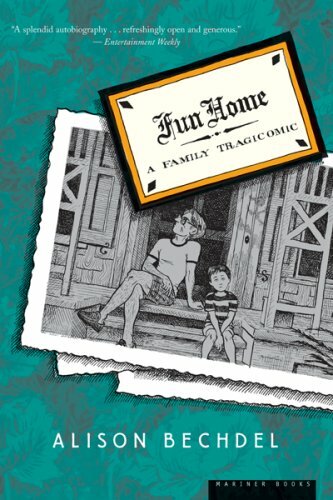 I’ve gotten away with reading some lighthearted books this month, and honestly, when I picked up Fun Home (a Christmas gift from my husband), my brain only processed the comedy half of “tragicomedy.” I was having trouble sleeping, and this seemed like the perfect remedy. It’s a graphic novel (although the style is composed in such a way that even my brain can process it), it’s been on my reading list for a while, and I tend to think of Bechdel as a comedic online presence, although that’s not strictly an accurate description of her body of work. Bechdel is a deeply intellectual woman who, for almost thirty years, has been writing about the frustrations, limitations, and ridiculous incongruities of womanhood and sexuality, and while she does approach these topics (and others, like her family, the focus of this memoir), with a healthy sense of humor, her observations are razor-sharp and often devastating. Her writing and illustrations don’t skirt the inconvenient or uncomfortable truths she has encountered. Instead, she leans into the moments of drama, drawn from her own life experience, without attempting to spare herself or save face. Reading Fun Home, I often found myself trying to skim over the hardest sections on her behalf. I thought about what it must be like for her family to have their lives shared in such a raw way; while she is far from the first artist to mine her own history for this kind of material, as a reader, I struggle with the sacrifices that come with such a choice. I wanted to spare her the uncertainty, the missed opportunities for family acceptance, the terrible secrets that were kept from her until adulthood. As ridiculous as it is to crave such a thing – to believe that averting my eyes from her confessions would ease some of the pain she’s had to endure – her presence as a writer draws out the most empathetic parts of me. Her vulnerability is truly a remarkable strength. Her openness too though is a source of power. Society leans toward secrecy, toward hiding the less desirable parts of ourselves, but there is an incredible freedom in accepting the flaws and challenges that come from being human. Shaming those parts, or even politely declining to acknowledge them, is a misplaced attempt at perfection and uniformity. It brings no joy to deny the unique journey every person is on; in fact, it eats at the heart of the kind of power that brings a book like this to life. Really, it destroys the power that brings any number of books to life. As readers, we crave authenticity, whether it be in memoir or in fiction, in three lines of poetry or in a thousand page fantasy. The human experience as viewed through a million imperfect lens is what fills library shelves and brings us closer to each other while feeding our enthusiasm and understanding of the wider world. A book like Fun Home, which blends the visually light style of a graphic novel with the emotionally challenging landscape of Bechdel’s youth is just one more lens we can peer through, accepting, hopefully, both the hard truth and her compassion on the other side. For more about Alison Bechdel, go here. It’s been a while since I’ve come across a book that perfectly filled a spot in my soul that I didn’t even know I needed filled until I read it. I was at a Christmas faire at the beginning of November selling books with my friend Steve. He had just received his copy of Letters (he had contributed a piece to the conclusion), and I was marveling at the beautiful job Anderson’s publisher had done with the book’s endpapers (I might have been drooling over them, in fact). The whole book is peppered with Anderson’s incredible photography of France and Spain, but those endpapers…I was smitten. I absolutely had to read the book. It was too lovely to pass up. Sometimes beautiful books disappoint. So much work goes into the design, but the content doesn’t live up to the reader’s overly high expectations. Not the case here. No. 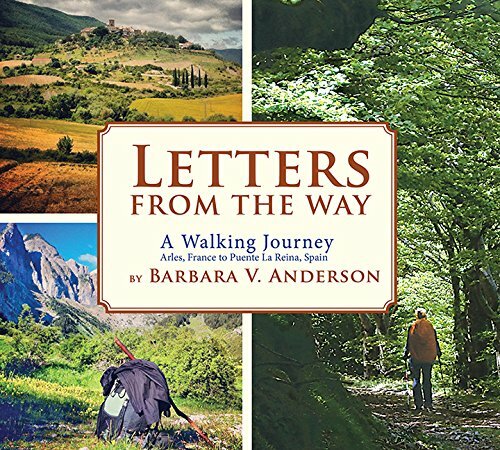 I planned to savor Anderson’s book, a collection of letters she wrote home to friends during her unconventional pilgrimage. It seemed like too dense a topic to burn through, but once I began, I couldn’t stop. I found myself desperate to be transported to the wet cold forests of France, to the hot rocky roads of Spain, to the lush mountain sides, and even to the awkward, perfect, exhausting dinners with strangers (dinners I couldn’t even eat, I should mention, given that I’m lactose intolerant and cannot have red meat or pork!). Her “long walks,” as she thinks of them, are far from perfect. Bad weather, obnoxious walking buddies (for miles and miles and miles), excruciating injuries – she’s plagued with all of them – yet my desire to join her adventure never faltered. She was searching, in part, for some proof that God exists. Most pilgrims believe in a higher power before they set out; Anderson does not. My impression was of a sensibility both artistic and scientific in nature – something along the lines of Da Vinci or Tim Jenison (if you haven’t watched Tim’s Vermeer, you’re missing out) – a desire to seek and believe in extraordinary things from a mind firmly rooted in tangible reality. At the same time, her appeal is largely in how relatable she is in these letters written from the road She is an ordinary woman pursuing something exceptional. The result is a book I cherished. I took it with me all day, reading it in the car in the parking lot of a friend’s apartment, then while waiting to pick up my dry-cleaning. I reread some of the letters later in the week and only grudgingly returned Steve’s copy to him after I’d kept it three weeks longer than promised. Reading about Anderson’s journey was a perfect escape from Christmas shopping, from the return of an ant infestation, from the daunting list of things that must be done before we leave for an early and extended trip for the holidays. Hers was Europe the way I imagined it when I was small – the slow-paced day, the café au lait at dawn and the wine at night, and the people both strange and civilized. Her world, for those weeks, was one I had imagined well before and was delighted to see, for a moment, come to life. But here’s the thing – there’s a solution to what I’ve started calling the “November is hell” problem. And that solution is audiobooks. Yes. Audiobooks. Usually the bane of my existence (I have almost zero ability to concentrate auditorily), this month, the audiobook is my saving grace. I can listen while cooking dinner (or cleaning up the kitchen from a week’s worth of dinners). I can have it on while I’m in the shower or running errands or waiting to pick my husband up after work. As an added bonus, I can listen to NPH at double speed and get through his jokes in almost half the time! Seven hour book listened to in four? Win! I suspect it wouldn’t be easy for me to pull this off with a novel, which is why I almost never listen to them, instead choosing memoirs or biographies that don’t require following a complex plot. Nothing slows down a speed read listen like having to constantly rewind to catch up on what transpired while I was multitasking. I’ve found this is especially effective when listening to books written and read by comedians, like Harris (or Fey or Kaling). I’m so used to the rhythm of his speech from years of watching How I Met Your Mother and Doogie Howser, MD that it’s more like a one-sided conversation with an old friend than a book. It was surprising too, when I told friends I was reading it, that when they inevitably asked whether it was hilarious, I had to stop and say…well, yes. Sort of. But also, no. Which they then took to mean he didn’t successfully execute his jokes, but which actually meant that his story is set up less for laughs than it could have been. Instead, he’s sincere, and sweet, and somehow both self-deprecating and vain. Harris is witty, but also surprisingly vulnerable. It’s possible it’s just a side effect of listening to a person’s life story told in their own voice, but it’s hard not to root for Harris, to celebrate the birth of his children with him, and to recoil in anger at the discrimination he’s experienced. The format has an empathetic effect on its listener. The fourth wall comes down, and for a few busy hours, it’s possible to be a part of his world. For more about Neil Patrick Harris, head here.